Automotive Engineering Show in New Delhi next week to showcase the latest in automotive manufacturing technologies. India’s leading technology players, including Banner Engineering India Pvt Ltd, Dow Corning India Pvt Ltd, Faro Business Technologies India Pvt Ltd, ifm electronic India Pvt Ltd, Keysight Technologies India Pvt. Ltd, Leuze Electronic Pvt Ltd, Micro-Epsilon India Pvt. Ltd, MSC Software Corporation India Pvt. Ltd, SAP partner Cogniscient Business Solutions (P) Ltd will be displaying their latest and upcoming technologies for the shopfloor. 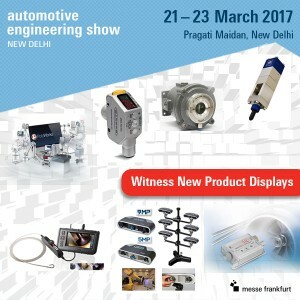 Bringing together companies whose technologies are used by major automotive players across the world, this key business event will be held from 21 – 23 March at Pragati Maidan, New Delhi alongside the leading ACMA Automechanika New Delhi. The co-located platforms targeting automotive manufacturing and aftermarket will open new doors for business, networking and sourcing cost-efficient automobile factory solutions. The FARO® Cobalt Array Imager, an unlimited Multi-Imager Scanning Configurations which captures millions of high resolution 3D coordinate measurements in seconds. An industry first, the Cobalt Array Imager is equipped with dedicated on-board processors that can dramatically improve cycle time. With low-cost, reliable and efficient technologies dedicated to engineering and design processes of automotive industries as well as target planning, shop floor and quality control technologies on display, the fair will be an important stopover for any vehicle manufacturer looking at expanding their manufacturing capabilities. Alongside the exhibition area, a specialised conference will bring together delegates from top notch automotive OEM’s and Tier 1 and 2 component manufacturers, besides leading IT and technology solution providers. The high-profile gathering will open discussions on three key themes leading disruptive innovations in the industry such as: Convergence of Technologies in the Automotive Plant; Skilling India for Industrie 4.0; Workshop on Surface Engineering in Automotive Industry. Organised by Messe Frankfurt Trade Fairs India Pvt. Ltd, the platform will provide an opportune framework for sourcing, networking and exchanging technical know-how on manufacturing solutions that can drive down costs for the sector.